A week ago my BFF texted me asking how I use my washi tapes. I realized I haven't used any (except for my planner of course) recently. I thought it is time to gather some ideas and maybe make a video of it. I posted how I organize my washi tapes using a pant hanger last year. I'm very proud to tell you the collection hasn't grown. I've committed to BUYING LESS AND USING MORE. Here I'm sharing 3 ways to use washi tapes, decorating index cards, storage box and paper crown. WHERE TO BUY WASHI TAPES? Many of my washi tapes are from the brand "Scotch". They are called washi tape or decorative masking tapes. You can find this brand in Target, Walgreens, sometimes Dollar Tree. Dollar Tree has their own brand of washi tapes. They are not as thin and sticky as the Scotch washi tapes. Micheal's, they have a aisle full of washi tapes. Thin or thick, pattern or solid, you'll find yourself totally lost in the aisle. Amazon and eBay are great places to find washi tapes, especially the seasonal ones. There are a lot of sellers from China sell washi tapes on eBay. It costs around $2 to get a unique pattern with good quality but the shipping usually takes 1-2 months. I use the index cards as reminders to sing a few songs with my kids in the car. The doctors say we should constantly talk to the kids when we do daily business. Let me just admit this, talking to a 18 month old is BORING! Especially in the car I'm not facing her and she is not talking back. I don't mind sing though. I believe singing is a great way to teach words. First I talk slowly when I sing. Second the words repeat and rhyme in the kids' songs. When I am driving I just can't think of songs I can sing with her except for Wheels On The Bus and If You Are Happy. Now I have the index cards with lyrics written down. I bring them to the car and I can sing the songs we like. 2. Washi tape covering vanity tray. I posted this last January. Click HERE if you are interested. The neighbor's girl got a crown from Burger King. She looked so precious wearing that paper crown. Of course my 3 yr wants a crown now. I just cut out a crown template from a white poster board (Dollar Tree, $0.49) then decorated it washi tapes. 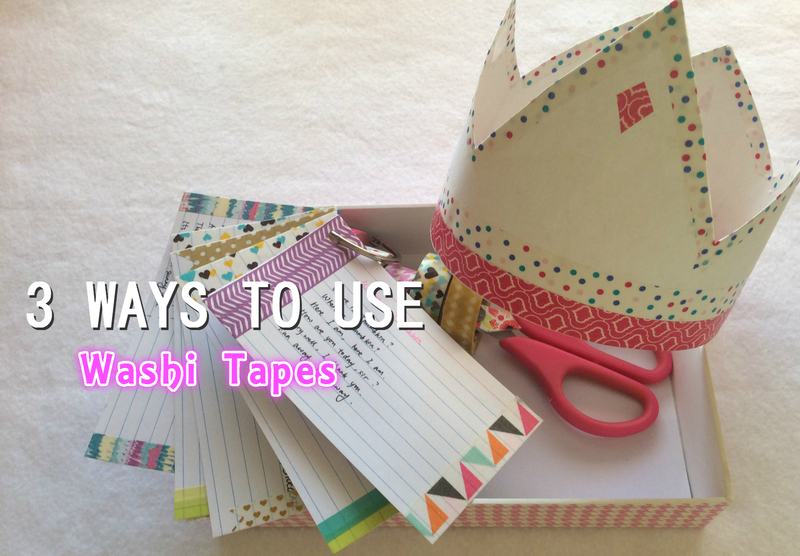 Now share your ways of using washi tape with me by commenting below. Enjoy the rest of your weekend.